I am always looking for new Mexican dishes, and this casserole did not disappoint. We both really liked it. It was easy to put together. The best part was I had everything in the pantry. This could be assembled ahead of time and baked when you are ready. This is a hearty dish. We had the leftovers for lunch the next day and they tasted great. I made this in a 9x9-inch dish, but you could also bake it in a 9x13-inch dish if you wanted a thinner casserole. Next time I might use one layer of tortillas and top the casserole with tortilla chips for a nice crunch. In a large skillet, brown ground beef. Drain. Return to skillet and stir in taco seasoning, Rotel tomatoes and black beans. Heat for 5 minutes. Set aside. In a small bowl combine soup and sour cream. Set aside. Lightly spray a 9x9-inch pan with cooking spray. Tear up 3 tortillas and place in bottom of pan. Spread half of the sour cream mixture over tortillas. Top with half of meat mixture. Top meat with half of cheese. Repeat layers. Bake 25-30 minutes until bubbly. Top with additional sour cream and salsa, if desired. 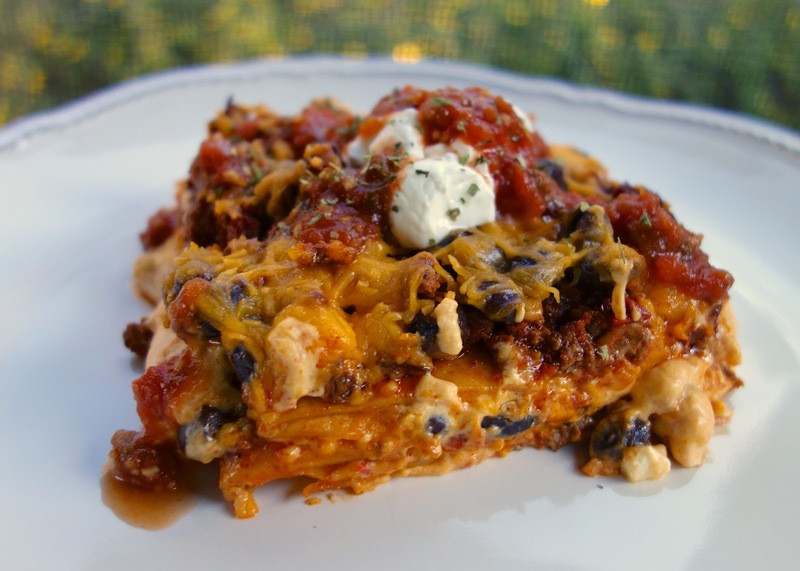 I love casserole recipes like this! 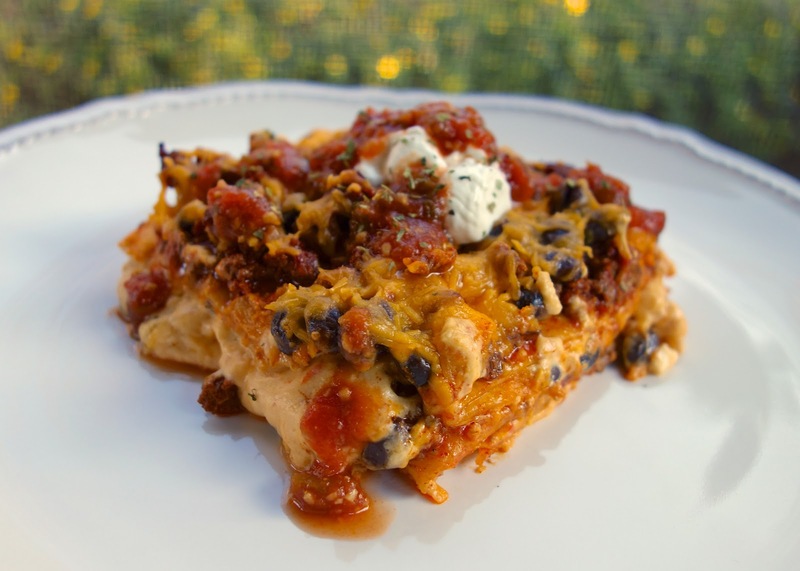 You always make the best looking baked Mexican dishes. Made this tonight and it was lick the pan clean yummy!!!! Wow! We eat a lot of Mexican food - so I'm always looking for new recipes to try too! Pinned this and can't wait to try it! I made this last night for dinner. It was so yummy! Most definitely will make it again! Yum! Looks great! I came from AL Women Bloggers, thanks for sharing! and a lot easier to assemble than individual burritos! i couldnt find the cambells soup except just cheese type i have looked at 3 stores now can i just ues the cheese kind or how should i fix it to make it like the one you mentioned? mkkiki - you can use the plain cheese type and just add a few tablespoons of salsa to it. Enjoy! Could you freeze this pre-baked and then bake later? I always worry about things like the sour cream getting curdled when it's frozen. I'm looking for freezer meals to pre-make and then bake when I get home. I made this for dinner tonight. It was so good. I will definitely make this again. Thanks for the great recipe!